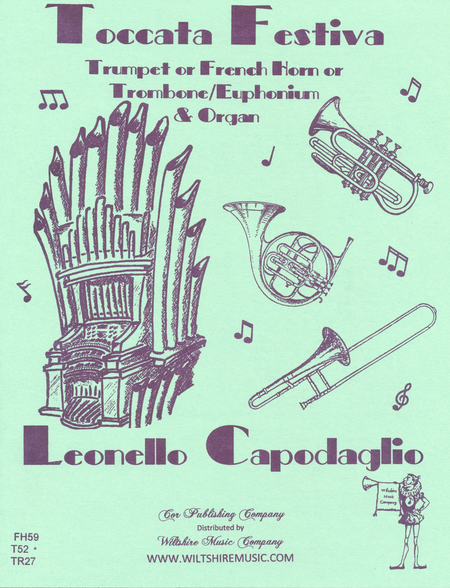 The score seems to indicate that Toccata Festiva was originally intended for trumpet and organ. The publisher also supplied a horn and trombone/euphonium alternative. The trombone/euphonium and the horn parts supplied are unfortunately in the wrong key. The trombonist would have to transpose the part down one step in order to be in the same key as the organ. If the horn part is meant to be in F, it too would not match the organ key. The musical language is traditionally tonal. The solo parts are technically performable by a good high school level player. This work is appropriate for prelude music in a church service.